What it’s about: In anticipation of Franzenmania descending with the release of his new novel, Freedom, my book club decided to read the book that started it all for him: The Corrections. 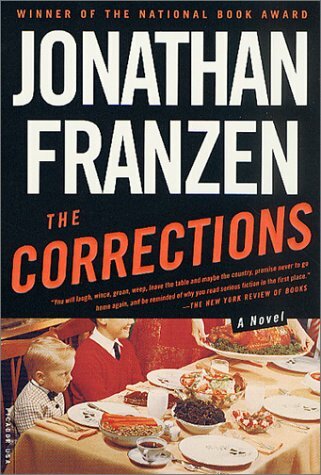 Written about ten years ago, The Corrections made Franzen a star. Then he dropped off the face of the planet and spent a decade working on his next novel. He’s the first living author in a decade to have appeared on the cover of Time magazine. He was selected for Oprah’s book club, but turned her down. Yes, this is a man whose book was so successful, he could say no to Oprah. (Note that he and the Big O have made up. She selected Freedom as her next book and he has gracefully agreed to appear.) So, did his first book live up to all the hype? Yes, I think it did. The Corrections is the story of a midwestern family, their dysfunctional history and often misguided and unsuccessful attempts to connect and understand one another. Now in their golden years, Enid and Alfred are still living in their old house in St. Jude, where Enid rages a daily battle with her husband, who is rapidly losing his mobility, bowel-control, and mind to Parkinson’s disease. Once the proud patriarch, Alfred has begun to hallucinate, but hides in the basement hoping to fight off his demons and keep his children from truly seeing the extent of his dementia. Meanwhile, each of their grown children is dealing with their own demons. Chip has lost his job as a professor following a torrid affair with a student. Now, his revenge fantasy centers on an overwrought screenplay that’s a thinly veiled story of his life. Living in New York without a steady income and recently dumped by his married girlfriend, Chip jumps at the chance to travel abroad to conduct some business of questionable legality. Gary is struggling every day with the realization that he’s becoming more and more like his father. His childish wife Caroline has him questioning his sanity as she slyly hints that he’s depressed and turns his children against him in a plot to stay away from St. Jude, Enid, and Alfred at all costs. Denise has all the trappings of success as the executive chef of the best restaurant in Philadelphia. But she is coming apart at the seams as she realizes that she’s perpetually the other woman, falling again and again into impossible relationships. It all culminates in Enid’s dream: one last Christmas in St. Jude. More than anything she wants to gather her family around her and celebrate in their home for what she realizes may be the last time. One of the strangest things about this book is that there is no hero. Each character is reprehensible. They are annoying, stubborn, wrong-headed, vain, selfish, or vengeful. But rather than turning me off from the book, it only drew me in deeper. Watching their lives fall apart is somehow cathartic. Their situations are impossibly convoluted, cartoonishly insane, but somehow they also seem very real. The horror and wonder of The Corrections is that this could be any family, even our own. And there is ultimately some redemption for a few of the characters. Enid in particular, who seems to be a shrewish villain from the start, turns out to be the real heart of the story. The book also compelled me to think carefully about aging. One of the central questions in the novel revolves around how to handle Alfred’s condition. His children know he’s unfit to live at home and that caring for him is beyond Enid’s capabilities. But, Alfred and Enid don’t want help and don’t want to leave home. It forced me to think about my own future, both how I’d handle this situation with my own parents someday or how I’d want it to be handled when it’s my turn. Though the plot is dark, the tone is blackly comic and the book often made me smile and laugh as much as it made me think. I flew through it and truly enjoyed Franzen’s expansive narrative. More than anything, the book feels real. Though you may not identify with the characters, I think you certainly believe in them and understand them. In showing family at its worst, Franzen opens a door to thinking about our families and perhaps appreciating them a bit more. Would I recommend? Most definitely. I’m going to elevate this book to one of my favorites, for amazing characterization, a compelling story, dark humor, and thoughtful voice. Freedom is going onto my queue!